WHITE fences and manicured lawns surround the villas of an elegant housing estate in Ethiopia, a potent symbol of the emerging elite in a country that decades ago was better known for drought and famine, but has made a remarkable turnaround in recent years. Just 10 years ago, the affluent suburb of Yerrer View was little more than fields. Today, imposing villas with pillars stand behind neatly-trimmed oleander hedges. A comfortable commuting distance of 20 kilometres (12 miles) from the capital Addis Ababa, the 600-hectare (1,500-acre) estate has tapped into a growing taste for high-end luxury among wealthy Ethiopians, who are looking for a home which reflects their success in business. Over the past decade, this Horn of Africa nation has seen an annual growth rate of nearly 10%, the highest in Africa, World Bank figures show, due to a boom in construction, manufacturing, trade and agriculture. For those in Africa’s second most populous country who are enjoying that growth, the estate symbolises much more than a home. “We are selling a lifestyle more than just housing,” says Haile Mesele, a civil engineer who heads Country Club Developers, the property firm behind the development. “We don’t do any advertising. We prefer that the residents themselves spread the news, and in a way, choose their own neighbours,” he said. According to a recent study by New World Wealth (NWW), a South Africa-based market research consultancy, there are now 2,700 millionaires in Ethiopia, reflecting an increase of 108 percent between 2007 and 2013—the fastest growth rate in Africa. “There is a demand for luxury real estate,” said Wunmi Osholake, who runs the Ethiopian branch of online real estate platform Lamudi, which focuses on emerging markets, with customers eyeing property costing over $330,000. The price, she adds, has no upper limit. And the luxury boom is not just in the suburbs. In the centre of Addis Ababa, the bustling Kazanchis business district is also undergoing major renovations. 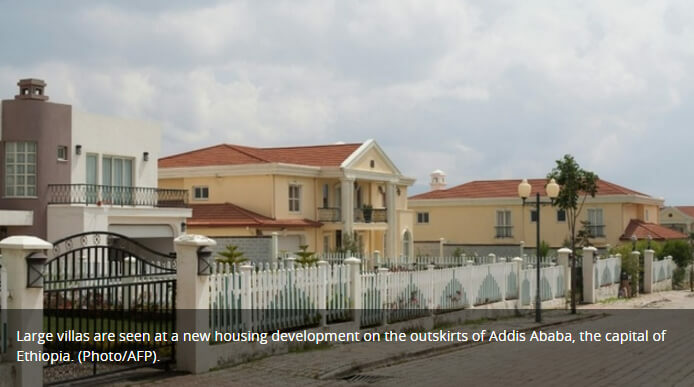 Eighteen months ago, May Real Estate Development began a new residential development called the Addis Gojo project, which incorporates 113 apartments in three 10-storey towers located near several embassies. “For those working for the UN or diplomats, it is very central. The district is a new sort of Manhattan,” says project manager Bitania Ephfrem. A standard apartment between 140-170 square metres (1,500-1,800 square feet) rents for about $1,800 per month (1,700 euros). Such luxury housing has been designed to meet the needs of Ethiopia’s emerging new middle class. At the estate in Yerrer View, hundreds of the homes from stand-alone villas to modern apartments are already occupied with plans for a total of 5,400 houses for some 20,000 people. When completed, the estate will also include a golf course, a five-star spa hotel, a shopping centre, school and clinic and an organic farm covering about 200 hectares. The customers have high expectations. Pushing open the door, Mesele shows off a 500 square metre (5380 square foot) property built on a plot measuring 1,000 square metres. A large open plan kitchen and a curved imitation-marble staircase leads up to the first floor where there are three bedrooms, all en-suite. The master bedroom has a fireplace and a dressing room, while the bathroom has “an open space in case the owners want to install a sauna,” he explains. All that remains is to install surveillance cameras able to read a licence plate before opening the gate, smoke detectors and a security system. And the price tag? $400,000 (377,000 euros)—a fortune in a country where the gross domestic product per capita is $565. “No matter what we build, it will always be too little to meet demand,” he says. But others have spotted the growing demand, with several other sites popping up nearby. Since the overthrow of a Marxist junta in 1991, Ethiopia’s political and economic situation has stabilised, although rights groups have criticised the government for suppressing opposition. The economy is still heavily dependent on agriculture, especially coffee, with the vast majority of the country’s workers involved in that sector. Meeting the demand for new housing has called for bringing in foreign workers as Ethiopia lacks a skilled work force. Haile said his firm recruited around a thousand specialist workers from China. Yoseph Mebratu, the major shareholder in May Real Estate Development, also complains that he had to import 70% of raw materials. Inflation, which hit a record 64.2% in July 2008 but has since stabilised at around 13%, has also caused delays. “We had to slow down our business and missed deadlines… but since last year, we have become profitable again,” Mesele added.